Few relics of military history are as striking as the German Pickelhaube. The black lacquered leather helmet with its intricately detailed gilded brass helmet plate and tall spike was intended to create the image of highly aggressive military force. The quick German victory over France in 1871, lead many countries to imitate the style of the Prussian army. Many countries around the world adopted some form of spiked helmet for their own armed forces, including the United States in 1881. The Color Guard of Chile still uses the Pickelhaube, using helmets made in Germany with leather imported from Argentina. The helmet was originally designed by the Prussian King, Friedrich Wilhelm, in 1842. The shortcomings of the original design were immediately evident, but the King had an irrational attachment to his creation. In 1856, the King was judged to be insane, and his younger brother, Wilhelm, served as Regent until his death in 1861. 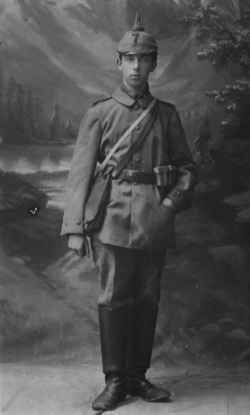 Wilhelm then became King Wilhelm I. The 1842 model helmet was ridiculous, even by 19th century standards. It was so tall that it was proposed that the soldiers carry their mess kits inside the top of the helmet, and it was very unpopular with the troops, as it had a tendency to fall off during drill. Beginning in 1856, there were many reductions in height and other simplifications up to 1895 when the helmet reached the appearance it maintained up to 1914. On January 18, 1871, following the end of the Franco-Prussian War, the German Empire was founded. King Wilhelm I, became Kaiser Wilhelm I. The new empire was composed of the Kingdoms of Prussia, Bavaria, Saxony, and Wurtemburg; the Grand Dukedoms of Baden, Hesse, Oldenberg, Mecklenburg-Schwerin, Mecklenburg-Strelitz, and Saxe-Weimar; the Dukedoms of Anhalt, Brunswick, Saxe-Altenburg, Saxe-Coburg-Gotha, and Saxe-Meiningen, the Earldoms of Lippe, Reuss-Greiz, Reuss-Schleiz-Gera, Schaumburg-Lippe, Schwarzburg-Rudolstadt, Schwartzburg-Sonderhausen, and Waldeck-Pyrmont; and the Free Cities of Bremem, Hamburg and Lubek. Few things in the German Army were standard prior to 1914, but the basic construction of the infantry Pickelhaube was an exception. There are three main leather parts of the helmet; a basic shell with a front and rear visor, that are sewn on. The shell was formed by pressing a piece of steamed leather through a large mould. The helmet was then covered in many layers of black lacquer until it could be polished to a bright finish. The helmet had two brass reinforcing trim pieces, at the front visor and a brass spine at the rear of the helmet. The front of the helmet is covered with a large gilded brass helmet plate. Guard regiments, train battalion units, and Bavarian Pioneers, had silver plated helmet fittings and related trim to distinguish them from the 'line' regiments. Each German Kingdom, Dukedom, Earldom, Free City, etc., had it's own unique helmet plate. A full description of all the different helmet plates would, and does, make a very thick book. This discussion is limited to the basic 'line' infantry enlisted man's helmet of 1895, and wartime changes up to 1916. The drawing below, illustrates the basic details of the 1895 model line infantry helmet. A group of Bavarian soldiers pose for the camera, circa 1909. There are seven infantrymen wearing the model 1895 Pickelhaube, and five Jagers (Light Infantry) wearing the model 1895 Tschako, machine gun companies also wore the tschako. All of them were on active service at the time the photo was taken, as they are all equipped with new Gewehr 98 (Mauser rifle model 1898). The bright finish of the leather helmet and brass helmet plates and trim is very evident in this photo. Soldiers fighting in the Franco-Prussian war quickly learned that the bright fittings of the helmets drew sniper fire. Soldiers covered their plates with pitch, or removed them. In 1884 a white helmet cover was used to designate 'enemy' troops in field exercises. In 1892 a reed green helmet cover was intoduced for for all troops for wear in field exercises. In 1897 all line infantry regiments were directed to sew red regimental numbers on their helmet covers. By 1914 the official color was mustard yellow, but many other colored covers are found, including ocher, tan, mouse grey, field grey, and slate grey. During pre-war manuvers a red band would be placed over the canvas cover to indicate 'enemy' troops. A very dapper artilleryman, circa 1914. The '7', on his helmet cover is his regimental number. In August of 1914, the color of the number was changed from red to dark green. By 1915, the number was left off all together. His helmet cover does not fit particularly well. This was common for enlisted men, unless they went to the expense of a private purchase cover of higher quality. A note on the back of the photo further indicates that this soldier served with the 7 Field Artillery Regiment, 2nd Company. The soldier is wearing riding boots, which were taller and of thicker leather than the infantryman's jack boot. Field artillery units used the Krupp 77mm gun, and were considered to be mounted units, as the gun crew also rode the horses pulling the gun. The 3 section leather ammo pouch on his belt is the cavalry model, which held 10 rounds per section. The infantryman's ammo pouch held 15 rounds per section. Heavy artillery units were referred to as Foot Artillery, as the artillerymen marched along next to their guns. 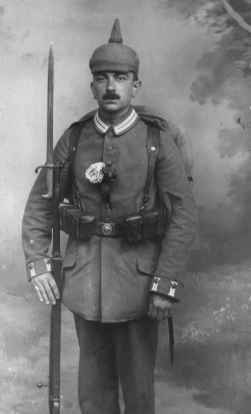 This soldier, circa August 1914, is a member of a Prussian Guard Reserve Regiment, as indicated by the white with red trim Litzen on his collar and sleeve cuffs, and by the lack of a regimental number on his helmet cover. Only guard regiments and a few line regiments of special note wore litzen on their uniforms. In pre-war Germany, all units had their regimental numbers on the helmet cover, except for guard regiments. This soldier is an enlisted man, but wears an officer's style, private purchase cover over his helmet, that is tailor fit. His rifle is the obsolete Gewehr 88 (Mauser rifle model 1888) , with an 1870's era bayonet. Active regiments were equipped with all the standard new equipment. Reserve units received what was left over, ersatz (substitute) equipment, and what was available in reserve (obsolete) stocks, although they often served in the front line trenches. Train depot and prison camp guards often used the Mauser 1870 model rifle, or the numerous Moisin-Nagant rifles taken from captured Russians after the Battle of Tannenburg. A standard Bavarian line infantry helmet, 1895 model, in rough condition. In 1886, Bavaria adopted the Pickelhaube, the last German State to do so. The kokade on the right side is the German Reich kokade. Black, white, red, were the national colors of Germany. The kokade on the left is the Bavarian Land kokarde. White, blue, white, were the State colors of Bavaria. Each German State had their own unique color scheme for the Land kokade, and unique helmet plate. The gilded brass plate on the helmet bears the Bavarian State coat of arms supported by two lions, and the State motto, In Treue Fest (In Loyalty Steadfast). The inside of the rear visor is stamped '15 I.R. ', indicating the 15th Bavarian infantry regiment, the regimental number is embossed, and not an ink stamp, indicating that this helmet was made prior to 1914. All fittings and kokades are original to the helmet. The title of the regiment was 'König Friedrich August von Sachsen'. The King of Sachsen (Saxony) was the honorary, commander of the regiment. This was a common practice of courtesy among the aristocracy in the pre-war German, Austrian and British armies and navies. The Kaiser was an honorary commander of various British and Austrian regiments and an admiral of the British Navy, until 1914. King George V and Czar Nicholas II were both honorary commanders of a German Regiment. An Ersatz (Substitute) helmet, made of lacquered steel, made in early 1915. The start of the war brought on the British blockade of Germany. Leather for helmets was imported from Argentina, and the demand for helmets exhausted supplies almost immediately. Manufacturers of kitchen utensils were called on to turn out helmets of thin steel and tin. Although the helmet is steel, it offered no real protection in combat, nor did the leather helmet. All other fittings are standard 1895 model brass fittings. The helmet plate is a pre-war type and not original to the helmet. The kokades are from the 1914 era, but are not original to the helmet. The chinstrap is a modern reproduction. Collectors refer to this as a 'parts' helmet, as it is an assembly of original parts. It does not have the same value as a complete helmet with all original fittings. Other examples of this type of helmet were painted field grey, with brass or steel fittings and plates, also painted field grey. A felt Ersatz Prussian Artillery Kugelhelm (Ball Helmet), made in mid-1915. All fittings are 1895 model parts, but steel, painted field grey. Other examples of this type of helmet used brass fittings when available. The helmet plate is the standard Prussian line eagle plate, with the King's motto, Mit Gott Für Koenig und Vaterland (With God for King and Country, i.e. Prussia). The right kokade is the German National kokade, and the left kokade is the Prussian Land Kokade, black, white, black, being the state colors of Prussia. The kokades and chinstrap are modern replacements. Many Artillery units had a ball on top of their helmets in place of a spike. By 1915 the detachable spike attachment had been developed so that soldiers in the trenches could remove the spike, as the spike was incompatible for service in the trenches and they made excellent targets for British and French snipers. A collateral benefit for this was that the same helmet could be used for infantry or artillery artillery units, simplifying the manufacturing and supply process. As the war continued, many other materials were used for ersatz helmets, including vulkanfibre, cloth covered cork, and paper mache. Older model leather helmets and fittings were altered for re-use, and helmets made up of leather sections were used to fill the demand. The Army Medical Corps demanded that new head gear be developed to reduce the number of head wounds. In February of 1916, the Stahlhelm (Steel Helmet) was introduced in small numbers to the front line troops engaged in the battle of Verdun. The resulting reduction in the number of head wounds suffered by the soldiers lead to the general replacement of the pickelhaube within a few months on the entire Western Front. On the Eastern Front, it was not until mid-1917, before the pickelhaube was completely replaced. It is interesting to note that the model 1916 Stahlhelm made use of the 1891 pickelhaube side post for attaching the 1891 model pickelhaube chinstrap. The side posts were attached to the inside skirts of the helmet. Even though the German army used the stahlhelm in greater numbers and for a longer time on the Western Front, it is the pickelhaube that invokes the memory of the German soldier during First World War. 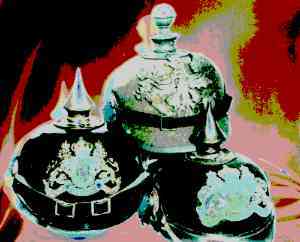 This short discussion is intended only to be an introduction to the subject of the German pickelhaube. There are many good reference books available for more detailed information, see list below. I also wish to thank Mr. Michael Gonzales and Mr. Chip Minx for their expert advice and comments.